This item is a restricted purchase. Only law enforcement and military personnel are permitted to purchase. If you are authorized to purchase this equipment then please fax your military or law enforcement I.D. to 866.415.7108. Then please call 800.458.1606 to place your order on the phone. Spyderco Autonomy Orange C165GSOR. 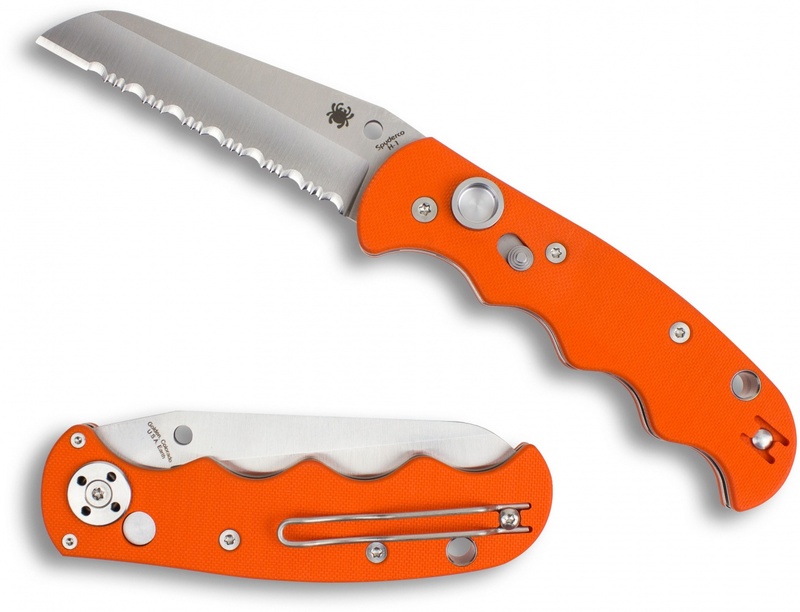 Bright orange, fully serrated- what better combination could Spyderco have come up with. The orange color will help you keep track of this Autonomy Orange knife. The large size handle- 5 inches- is perfect for your working needs. Fully serrated blade is 3.5 inches long and ends with a tanto tip. There is a lock down button to keep the blade closed and one button to push this knife open when ready for use. Large lanyard hole on the end and a silver pocket clip. Get your autonomy on with this great knife. Do you own Spyderco Autonomy Orange C165GSOR? Tell us about it! Have a question? Ask!